When we learn that fruit and candy symbols are on the paytable we can usually predict the appearance and gameplay of a slot as we’ve played enough online fruit machines to last a lifetime, however the Reel Rush video slot from Net Entertainment pleasantly surprised us and we have no doubt that you’ll be rushing to play it after reading this review. 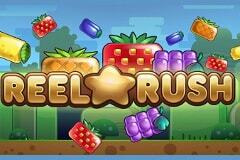 As soon as you load this free Reel Rush slots game it becomes obvious that Net Entertainment have taken inspiration from two of the most popular games ever to be released as the blocky platforms in the background will instantly bring back memories of playing Super Mario on the Nintendo, while the fruit and candy symbols are reminiscent of Candy Crush which has taken the world by storm in recent years. Reel Rush has a structure of 5 reels with 5 rows and 45 standard paylines, however this increases up to a mighty maximum of 3,125-ways thanks to the amazing Re-Spins feature which has been included and there is also a free spins mode too. Like the popular games which NetEnt have clearly taken inspiration from, you can play Reel Rush on mobile as it is part of the NetEnt Touch series which means tablet, iPhone and Android devices are all supported. When you finish this review and compare this recent slot release with classic fruit machines you’ll notice that the minimum stake is larger at 50p while the maximum you can spin the colourful reels for is £100, and while that may sound like a lot to low limit players, it’s well worth trying as you could cash-out up to 480,000 coins! Those of you who like to play video games as well as real money online slots will recognise the Wild symbol. While it will appear as just a star to many of you, it actually represents a power up in lots of games, and it certainly showcases how powerful it is in these vibrant reels as it can substitute for all symbols in both the base game and free spins mode, although it never appears on the first reel. There are eleven other symbols which fill the reels, six of which are types of fruits with the other five being types of candy, and they have all been designed in a blocky style in keeping with the bright background. Strawberries are tastiest of all here as they offer satisfying wins of up to 1,000 coins for you to sink your teeth into while you will also find yourself devouring pineapples for up to 500 coins, lemons are worth up to 250 coins, there are kiwi-fruits that bring up to 200 coins, grapes fill you with up to 150 coins and plums see you enjoy up to 100 coins. While the fruit symbols have been impressively designed, the candy symbols are nothing to write home about. They are represented by a circular candy with a differing colour for each (red, orange, yellow, green and purple) but all have the same values with up to 50 coins on offer for winning combinations of each. The key to getting, or getting close to, that maximum win of 480,000 coins lies with the Re-Spins and free spins features that Reel Rush boasts. Re-Spins are activated whenever you land a winning combination, either in the base game or during the free spins feature, with the number of ways to win increasing on each subsequent winning combination and we haven’t found a player yet who doesn’t love it. Your first reel re-spin sees the 45 paylines switch to 135-ways to win while the second sees this increase to 405-ways, on the third it jumps to 675-ways, the fourth and it’s 1,125 ways, while a fifth will see 1,875-ways to win. You may be wondering where the 3,125-ways to win we mentioned at the start of this review went to and that’s because this doesn’t come into play until after a fifth Re-Spin. Going on such a hot streak sees you rewarded with 8 free spins with 3,125-ways to win – a combination which never fails to deliver sensational wins! The blocky throwback design of the Reel Rush slot machine combined with the array of colourful fruits and candies you are tasked with collecting, the amazing sound effects, the Re-Spins feature which sees the number of ways to win increase and the free spins mode where you spin the reels at no cost all make for an incredible experience that will have you rushing back to the reels many times over!